This is the most significant reform of the U.S. tax code since 1986, affecting virtually all individuals and businesses. The TCJA, effective for 2018 through 2025, will impact your 2018 tax return to be filed in 2019. The major changes to tax code are described below in a concise manner. For 2017 tax year (hereinafter “Currently”), the individual mandate established by the Affordable Care Act (ACA), known as Obamacare, requires by law that people either buy health insurance or pay a penalty. New law: Starting with the 2019 tax year, the legal mandate to buy health insurance is repealed. Observation: You are not required to buy health insurance beginning tax year 2019. For the 2018 tax year, the “healthcare mandate” penalty still applies. Currently, seven brackets in individual tax code are: 10%, 15%, 25%, 28%, 33%, 35%, and 39.6%. New Law: retains seven income tax brackets but at lowered tax rates and thresholds. The highest income tax bracket has dropped to 37 percent from 39.6 percent. Under current law, taxpayers can either itemize their deductions or claim the Standard Deduction. Currently, the Standard Deduction amounts are $6,350 for singles, $9,350 for heads of households (HOH), and $12,700 for couples. Note that there is an additional standard deduction for elderly or blind taxpayers, which is $1,250 (married) or $1,550 (single) for tax year 2017. Note: The additional standard deduction for elderly or blind taxpayers is $1,300 for each married taxpayer or $1,600 for a single taxpayer. Observation: The standard deduction is now so large that most people no longer need to itemize deductions. The doubling of the standard deduction, a monumental change, will result in almost 90% of taxpayers claiming the Standard Deduction instead of Itemized Deduction. Currently, $4,050-per-person personal exemption deduction is available for yourself, your spouse and each of your dependents. New law: eliminates personal and dependent exemptions. Observation: Personal and dependent exemptions are gone as of January 1, 2018. How well the standard deduction and increased child tax credit offset the elimination of the personal exemption depends on a family size and filing status. The Child tax credit is currently $1,000 per child. It is non-refundable but the Additional Child Tax Credit makes it refundable if you are eligible. The child tax credit is available with income up to $75,000 / $110,000 singles/couples. Currently, there is no family tax credit. New law: Doubles child tax credit, adds family tax credit. It increases Child Tax Credit to $2,000 per child under age 17 (refundable up to $1,400 per child even if no tax is owed) while creating a new Family Tax Credit $500 for other dependents such as a child 17 or older, an elderly parent, or an adult child with a disability. The child tax credit phases out starting at: $200,000 / $400,000 singles/couples.The Additional Child Tax Credit merges into the Child Tax Credit. Eligibility for the child tax credit has not changed. Observation: The phaseout threshold increases sharply, making child tax credit available to more families with children younger than 17. Itemized deductions under current law include 6 categories of deductions that are addressed: Medical Expenses, Taxes (Income tax, Sales Tax, and real estate tax), Mortgage Interest, Gifts to Charity, Casualty and Theft Losses, and Miscellaneous Deductions. Under the new tax law, these deductions are either limited or eliminated. Current law: Total itemized deductions may be reduced, if your adjusted gross income for 2017 exceeds $261,500 for singles, $313,800 for couples ($156,900 for married filing separately), and $287,650 for heads of household. New law: Many itemized deductions are no longer available, or are limited. Under current law, homeowners can deduct mortgage interest paid on the first $1,000,000 of a mortgage. The $1,000,000 cap applies to a mortgage on two houses (primary residence plus a second home). Additionally, the homeowner can deduct mortgage interest on up to $100,000 of home equity loan interest. Homeowners can also deduct the mortgage interest on a 2nd home or vacation home. New law: For current mortgage holders, there is no change. The $1,000,000 cap remains for existing homes. For homes purchased after December 15, 2017, deductible mortgage interest is limited to a mortgage maximum of $750,000. Eliminates deduction for interest on home equity loan effective 2018. No mortgage interest is deductible on a second home or vacation home. Mortgage interest only on a primary residence is deductible starting 2018. Currently, either state and local income tax or sales tax deduction, as well as real estate taxes deductions, are available without any limit. No cap under current law! New law: SALT capped at $10,000 for taxes including income tax, real estate tax, and property tax. Currently, taxpayers can deduct the full amount of their cash contributions to charity (any 501(c)(3) non-profit organization) as long as the deduction did not exceed 50% of their adjusted gross income (AGI). New law: The new tax law preserves the deduction for charitable contributions and even increases the AGI limit on cash donations to 60%. Observation: Since the standard deduction has nearly doubled, fewer people will now itemize their deductions — and you can only deduct charitable contributions if you itemize. Currently, medical expenses exceeding 10% of Adjusted Gross Income (AGI) are deductible. Currently, casualty and theft losses can be deducted as an itemized deduction to the extent that they exceed 10% of adjusted gross income plus $100. New law: restricts the deduction to only losses attributable to federally declared disaster areas. Currently, unreimbursed employee business expenses - job travel, union dues, and job education are deducted to the extent that they exceed 2% of adjusted gross income. Currently, certain miscellaneous expenses, such as safe deposit box fees, tax preparation fees, and investment expenses are deducted to the extent that they exceed 2% of adjusted gross income. Itemized deductions not subject to the 2% limitation are retained. Currently, singles can exclude $250,000 and couples can exclude $500,000 of gain on the sale of a principal residence if they have occupied it as a principal residence for 2 out of the prior 5 years. Currently, moving expenses, generally costs of moving a taxpayer and his family and their belongings from Point A to Point B, are deductible. If the employer pays for these expenses, they are not income to the employee and not subject to withholding income tax or FICA tax for the employee. New law: eliminates the deduction for moving expenses except for active-duty military personnel. Observation: This means that any move, even those that are required for employment, are not deductible by the employee and are taxable income to the employee if paid for by the employer. Currently, the individual paying alimony can deduct payments from their income. The person receiving the payments includes them as income. New law: For divorces after December 31, 2018, alimony is no longer deductible by the payor and is not includible in income by the recipient. Currently, low and middle-income Americans can deduct up to $2,500 a year in student loan interest. Tuition waivers for graduate students who work as research or teaching assistants remain tax-free. The American Opportunity Tax Credit allows up to $2,500 credit for the first four years of college when working towards a degree. The Lifetime Learning Credit up to $2,000 is available for an unlimited number of years for certain costs of post-secondary or graduate courses or courses to acquire or improve your job skills. New law: preserves American opportunity credit, Lifetime Learning Credit, and Student loan interest deduction. Teachers continue to deduct up to $250 for unreimbursed classroom supplies. Tuition and fees deduction is no longer allowed under the new Tax law. The Alternative minimum tax (AMT) is a supplemental income tax levied to ensures wealthy taxpayers pay a minimum income tax. For high-income taxpayers, the tax liability is computed twice: regular income tax and income tax under the AMT rules, requiring them to pay the higher of the two amounts. Currently, for 2017, the AMT exemption amount is $54,300 for singles and $84,500 for couples who file jointly. The AMT exemption starts phasing out at $120,700 for singles and $160,900 for couples. New law: preserves AMT but raises the exemption amount to $70,300 for singles and $109,400 for couples. The phaseout threshold is dramatically raised: $500,000 for singles and $1,000,000 for couples. The actual 28% AMT rate remains unchanged. Observation: The AMT will now affect far fewer taxpayers than before. Created in 1969 to prevent wealthy taxpayers from avoiding federal income tax liability, the AMT expanded over time to hit middle-income taxpayers. The corporate tax rate currently varies from 15% to 35%. The corporate AMT tax rate is currently 20 percent. New law: Corporate AMT is eliminated. The vast majority of businesses (about 95% of the 26 million businesses in the U.S.) are set up as pass-through entities including sole proprietorships, partnerships, LLCs, and S-corporations. The net business income of a pass-through entity (other than a C-corporation) is divided among its owners who pay tax on their individual tax returns at individual income tax rates, which rise as high as 39.6%. New law: New tax code, called Section 199A, creates a new 20% tax deduction of your qualified business income (QBI), phasing out at $157,500/ $315,000 of singles / couples. The 20% deduction applies not only to pass-through entities, but also to real estate businesses, whether that rental real estate is owned as an individual or through a Single Member LLC. The deduction phases out on sliding scale from $157,500 to $207,500 (range $50,000)/ $315,000 to $415,000 (range $100,000) for singles / couples. QBI is generally net income without regard to salary or Guaranteed Payment. Example: Tom has $120,000 of net income on Schedule C. On his form 1040 (2018), he deducted Self-employed health insurance $10,000, One-half of his self-employment tax $8,478, and SEP-IRA contribution $10,000. His QBI is $91,522 ($120,000 – $10,000 – $8,478 – $10,000). 20% of QBI $91,522 comes to $18,304. Once your QBI is above the threshold amount $157,500 (single) or $315,000 (couples), the computation of this 20% deduction is subject to several limitations, which are complex. Please note: QBI includes sole proprietor net profit on Schedule C, real estate investor rental income on Schedule E, and the S-corp shareholder and partner “profit allocations” reported on the K-1s. QBI does not include capital gains, interest income, or dividend income. Further, QBI does not include S corporation shareholder-employee wages, guaranteed payments made to partners of a partnership, or other amounts a partnership pays to a partner for services. On January 18, 2019, the IRS provided “safe harbor” conditions under which a rental real estate activity will be treated as a trade or business for purposes of the 199A deduction. Observation: The Section 199A QBI deduction is a huge news. This new provision should ignite small-business growth. The estate tax is a tax on the transfer of property after someone’s death. Currently, the first $5.49 million in assets and about $11 million for couples are exempt from the estate tax. Beneficiaries also receive a “step-up” in basis for any assets inherited. New law: The top rate of 40 percent would apply to estates exceeding $11.2 million for singles and $22.4 million for couples; expires after 2025. No change in beneficiaries receiving a “step-up” in basis to fair market value at death for any assets inherited. Observation: Estate taxes will now apply to fewer taxpayers, with the basic exclusion doubled to $11.2 million for singles and $22.4 million for couples. This is the most significant tax cut since President Ronald Reagan’s Tax Reform Act of 1986. Critics say the debt-financed tax cuts risk higher interest rates, inflation, and massive new debt while supporters note that tax revenue generated by economic growth will offset much of the new debt. According to the nonpartisan Joint Committee on Taxation, the changes in the tax code are expected to reduce federal tax revenue [thereby, adding to the existing record high $20 trillion federal deficit] by an estimated $1.46 trillion over the next 10 years. Whether this massive tax cut will pay for itself with revenue generated through more jobs and higher wages remains to be seen. To find out how the new tax law impacts you and reap the most tax saving, it is worth scheduling a tax planning appointment with a tax professional. Reminder: This article only covers the highlights of the new tax law. There are many other changes affecting individuals and businesses. Disclaimer: This article is for educational purpose only. It is general in nature, and is not intended to and should not be relied upon or construed as legal, financial, or tax advice regarding any specific issue or factual circumstance. Shiv R Jhawar is an Enrolled Agent (EA) with over 3 decades of experience as a sole tax accounting practitioner in Chicago under the firm name of SRJ Consulting. As an EA, Jhawar can represent taxpayers before the Internal Revenue Service (IRS) in audits, collections, and appeals in all 50 states with the same rights and privileges as CPAs and Attorneys. Jhawar holds a Master of Accounting Science degree from the University of IL at Urbana-Champaign. 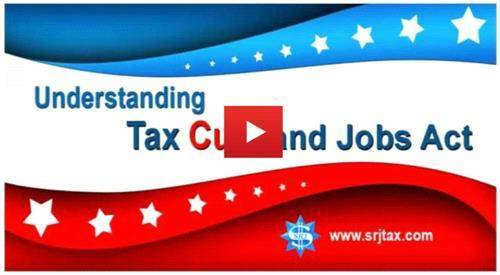 To learn more, visit his website at www.srjtax.com. SRJ Consulting have been preaparing my Tax returns for over 15 years ” and find them to be first class in preparation of all my Tax needs,. Shiv R Jhawar is very knowalage in all tax changes and is very easy to talk with, as and when I have any qestions . Would not hesitate to recommend this company looking for a tax preparation . and other services . Brian D Margolis Va . I have known SRJ for a long time. If India also had such a simple and specified tax system, and a consultant like SRJ, it would have benefited millions of taxpayers. Finally, a concise, easy to understand, summary of this new law. Thanks!